Skunk Cory is also known as sands Cory Cat. Just like other members of the Cory family, Slunk Cory has overlapping bony plates and sharp spines on the spine. These allow the fish to have a form of protection from its predators. Again, when netting the skunk, you should do it carefully to avoid the spines being caught in the net. The skunk has a special characteristic which helps them to survive when the oxygen is limited. They can breathe air directly by gulping it at the surface of the water. The air passes through their intestinal tract and oxygen is absorbed in the bloodstream. The body is cream white in color with a yellow gold sheen. 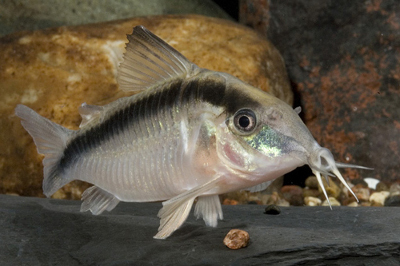 Unless other Cories which have a line running from the eyes all the way to the back, the skunk black stripe runs from the mouth, through the eye and arches at the back. The fins are transparent but the tail as a tiny dark spots. The nose is short and when it is resting the black stripes turns pale. It does not do well in acidic water. If kept in a tank, the tanks should have plantation to allow it to hide. There should be a space left for swimming as well as a smooth gravel to help protect their barbels. Again, salty water is a no, because it does not tolerate salt. Dim lights or black water is ideal too. A very peaceful species, skunk does not like living alone. It prefers more than a dozen mates. A good example of the fish that makes good mates is Dwarf Cichlids, Danios, Rasboras and small Catfish. Skunk is an omnivorous which means it can eat a variety of foods. Sinking foods are good since it is a bottom dweller. Foods like pellets or frozen foods are good to go. Spawning is quite a challenge for this species. The tanks should be filled with sand and plants to allow the fish have hiding places. The temperature of the water should be around 70 to 72 degrees Celsius. The pH should be around 7 dH.